It was such fun spending Carnival Saturday at the Margaret Street piano, capturing pedestrians play tunes. I had no camera to record but I thoroughly enjoyed playing the Cobb and Co Museum piano. 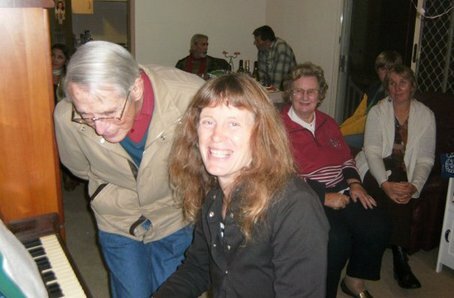 I met lovely people like local pianist Alison Bryant, sang together, exchanged ideas and truly connected. I then passed teenage boys kicking out some innovative improvisations at Margaret St on the bridge. Driving to Highview Chocolate Tea House, I played Sunrise Sunset, Climb every Mountain, and High on a Hill to a stunning sunset view of rolling hills and ranges from the verandah piano (great piano with good acoustics there and friendly beautiful teahouse) One suggestioin for increasing participation in this event would be for the pianos to be better located (each one was away from the passing traffic - too far from the walking crowds) and better highlighted with signs throughout town. I asked a festival volunteer for help finding the seemingly invisible pianos and he had no idea it was on. Many locals had no idea. Which means they were not in obvious enough locations and there were no signs leading to them. 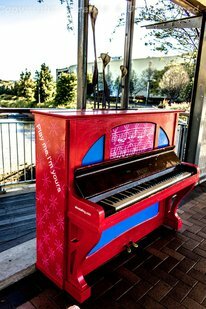 Online maps and street signs were needed to find pianos, especially for people coming from out of Toowoomba like me, but even for locals. thankyou Toowoomba for laying on the hospitality today and the flowers were amazing! 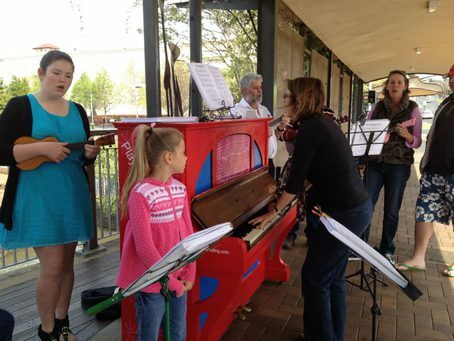 Members of the Toowoomba Ukulele Group (http://www.facebook.com/UkuleleGroupe) meet to play on a crisp but sunny Sunday morning and had a hoot knocking out a few tunes on the piano. Kids on bikes and a piano. "I can't play he said." "It does not matter what it sounds like," I replied. Every sound is creation!